1. In AD 312 Constantine I, Emperor of Rome, declared himself a Christian. Following decades of persecution Christianity by slow measure emerged as not only the accepted but the dominant and finally the official religion of the Roman Empire. The origin of 'Christendom' traces back to such, its perfection never realized, its dynamics rarely stabilized - but its legacy hardly disputed. 2. 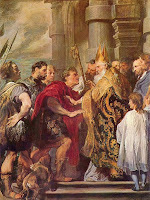 In AD 390 St. Ambrose, Bishop of Milan, threatened to excommunicate Emperor Theodosius I for his gratuitous rampage of ~7000 at Thessalonica. The ecclesial rebuke provoked an imperial response: 'with many tears and groans,' followed by much grovelling and penance, the Emperor made his plea to Ambrose to be re-admitted to the Eucharist. In the end he received mercy. (1) and (2) - what happened here? There is a strong tradition that sees in (1) the beginnings or roots of a tragic circumstance: the Church, called to be an alternative community and polis, an outsider and witness, folds into dangerous dilution and collusion with the earthly powers from which she has been called. The term 'Constantianism' designates no particular moment or period, but expresses rather the unfortunate marriage between (in our terms) 'church and state' which theretofore was not the message of the earliest Christians, nor the cause or significance of the martyrs. The witness of the church is compromised to the extent that its involvement and investment in political 'earthly' power obscures its distinct and other-worldly ('eschatological') character of peace through powerlessness. Thus (2) marks a precarious manifestation of this tension: Ambrose is right to condemn; but how he receives Theodosius back is where problems could arise. By accepting Theodosius' penance, does Ambrose then extend the purview of his bishopric too far? Is the Bishop of Milan to have authority over the Emperor? What is the nature of this authority? What is its reach? These are some questions which 'Constantianism' necessarily evokes. There is, on the other hand, at least a second tradition that sees some good in the occurrence of (1). It does not betray the martyrs that Constantine converts, or that Christendom is established, but in fact it takes the witness of the martyrs seriously: it stops Rome's violence (over time), and it encourages earthly peace. This 'earthly peace' is not heavenly peace, but is peace as a form of 'witness' itself - a witness to everlasting peace, to the eternal rule of Christ, and therefore to the present hope of the Church whilst she sojourns to her homeland. In this sense Christendom acts as a constant reminder of the provisional nature of political authority in the light of what True Authority stands over and above it. Note here a great caveat: the clergyman who takes this to mean he is the true authority falls into idolatry himself. The Church is differentiated not by any political absolutism but by her worship of God: she speaks to earthly authorities, working within political structures, to see both conform to a provisional self-understanding that allows for the Gospel to be preached politically. So (2) is a momentous occasion: it is right judgment expressed from the right vantage point, from the divine law (natural and evangelical) of the One True God. There is no doubt danger in such a pronouncement; no doubt temptation to take up further political authority; but it is danger and temptation implicit in these bonds, for the bonds of 'church and state' are always imperfect. Thus the charge of 'Constantianism' is true - true, that is, insofar as the Church fails to be faithful to her witness. Otherwise she is called to be in the world but not of it; preaching to government without pretending to be it; working through government without thereby worshiping it; helping with earthly peace without staking hopes in it. So I present two accounts hastily drawn of where political theology might start. It is not an exhaustive portrait to be sure, but it gives us an (imperfect) idea of the issues we're dealing in. Some questions: what does God call us to be in the 21st-century, and how might our history and tradition teach us what this is? What is faithful Christian political theology in light of what God has revealed to us - in all its mistakes and triumphs - through the witness of the Church many ages since? thank you so much for this insightful post. True, it doesn't start answering the questions of a political theology (nice term by the way, I think I will use it), but it is one of the several necessary starting points for sure. I've been trying to wrap my mind around this for awhile (I got so sick of the supposedly 'Christian' point of view in the election) and this helps me. I believe American evangelicals really need to take a step back to re-examine their political theology as it often reflects Constantianism at times, which I am against, at this point. But what is a proper political theology based on the whole counsel of God? I don't think it is explicitly taught but it is something I want to deep dive into it at some point. Constantiaism, from what I can tell (and I'm still pretty uneducated on the subject), coninued to stick around through the Reformation into the Enlightenment. Calvin and Luther seemed to whole heatedly by into the union of church and state from what little I do know...and that is disheartening, though understandable.